While many articles have debunked the myth that Israel is acting out of “self-defense,” very few have attempted to establish why Israel is continuing its assault on Palestine through Operation Protective Edge, aside from the supposition that Zionists have a fanatic penchant for drawing Palestinian blood. Behind the operation, behind the mass Israeli and U.S. propaganda attempting to justify the massacre, and behind the death of every child in Gaza is a conflict rarely discussed, an imperialist conflict and a contradiction that rests on Israel’s ambitions to appropriate and profit from Gaza’s natural gas resources. To provide some background, the natural gas issue arose in the year 2000 when British Gas (BG) discovered what they claimed to be $4 billion worth of natural gas reserves off the coast of Gaza. The Palestinian Investment Fund (PIF) and British Gas (BG) both invested in the project, with BG holding 60% of the rights. Since then, more gas has been found in the region. Michel Chossudovsky, a Canadian economist, has estimated that the amount of gas in Palestine is so grand that it could make Palestine as rich as Kuwait. In due reaction, since 2000, Israel has strengthened its maritime blockade on Gaza, denying Palestine basic rights over its territorial waters, driving away Palestinian fishing boats, and contaminating the waters so heavily from its naval attacks that the fishing industry essentially collapsed. “On its coastal littoral,” reported Peter Beaumont from Gaza several years ago, “Gaza’s limitations are marked by a different fence where the bars are Israeli gunboats with their huge wakes, scurrying beyond the Palestinian fishing boats and preventing them from going outside a zone imposed by the warships.” It is discernible that this is directly due to Israel’s appetite for Palestinian gas. In recent years, Israel’s energy crisis has deepened, as marked by a letter by two Israeli scientists. “We believe Israel should increase its [domestic] use of natural gas by 2020 and should not export gas,” the letter reads. “The Natural Gas Authority’s estimates are lacking. There’s a gap of 100 to 150 billion cubic meters between the demand projections that were presented to the committee and the most recent projections. The gas reserves are likely to last even less than 40 years!” As the need for energy has grown in Israel, so have their ruthless attempts to seek it. After the election of Hamas in 2006, Israel began negotiating with BG since, according to the former chief of staff of the IDF Moshe Ya’alon, the previously negotiated investment meant that a portion of the revenue could fall into the hands of Hamas and ‘threaten’ Israel. In other words, Israel wanted the gas, but they did not want part of the revenue to go to Hamas. Their solution, therefore, was to get rid of Hamas. More accurately, it is safe to affirm that Israel both desires a financially and militarily weaker opposition as well as a more subservient entity that may agree to willingly hand over its natural gas to Israeli profiteers. Operation Cast Lead began in June 2008, at the exact same time that Israel contacted BG to discuss critical negotiations around Gaza’s natural gas. As these negotiations continued, Israel was killing 1,417 Palestinians, displacing over 50,000 Gazans and destroying over 4,000 homes through air strikes and a deadly ground invasion with the declared purpose of securing areas within the Gaza strip that rockets were fired from. In reality, it had nothing to do with the rockets, or a notion of “self defense”, considering how disproportionate the casualties were—just as they are now under operation protective edge. 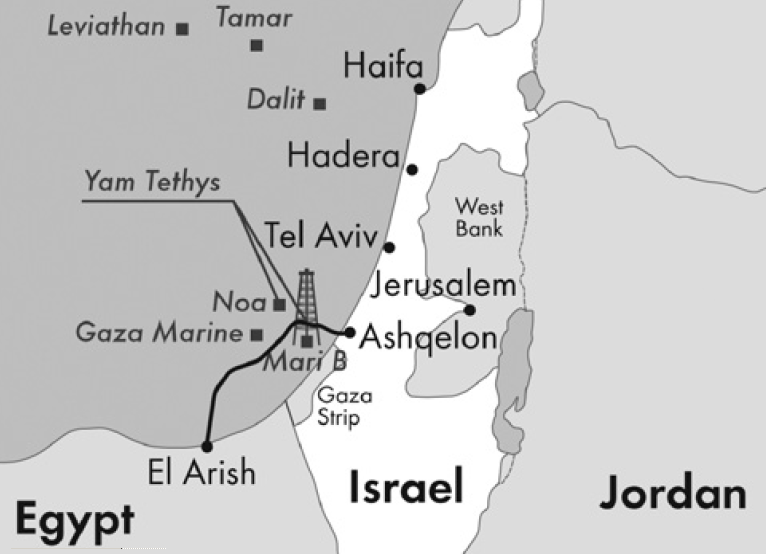 It was merely a means as part of Israel’s overall goal of appropriating Palestinian natural gas, both through territorial control and the failed attempt to defeat Hamas. While Israel was fighting to get rid of Hamas, they were simultaneously supporting and negotiating with Fatah. In 2011, a new round of negotiations with Fatah completely excluded Hamas from the process; in turn, Hamas declared these talks as illegitimate. Even more shocking, wikileaks cables from December 2010 confirmed that Fatah had asked Israel to attack Hamas. Yuval Diskin, the head of Israel’s security agency Shin Bet, made comments on Israel’s desire to strengthen Fatah. “Fatah is in a very bad shape in Gaza. We have received requests to train their forces in Egypt and Yemen. We would like to get them to get the training they need, and to be more powerful, but they do not have anyone to lead them”. Before that, in 2006 after the election of Hamas, Israel authorized the delivery of “light weapons and ammunition” to armed forces loyal to Fatah. All in all, it is clear that Fatah, heavily criticized by the People’s Front for the Liberation of Palestine (PFLP) and other liberation-seeking groups in Palestine, has at least to a great extent sold itself out to Israel. It is also evident that Israel would much prefer Fatah over Hamas in negotiations on natural gas. Operation Protective Edge, very much like Operation Cast Lead, has neither anything to do with self-defense (as the right may tell us), nor is it a meaningless slaughter motivated principally by a hatred for Palestinians (as the confused left may believe). It is very clear what it is: a war driven by the hankering yet callous lust of the imperialist capital of a colonial state to expand its appropriation of Palestinian natural resources and profit at the severe expense of the Palestinian people. While Palestine must receive the full support of people around the world in its struggle for national liberation, Israel must be unequivocally condemned for its indefensible war crimes and occupation of Palestine. It is clear that Israel’s Operation Protective Edge is a misnomer, as it should be renamed to something along the lines of Operation Capital-driven Genocide. The truth is, Israel’s brutality will continue and Palestine will never be free until the Zionist apparatuses of colonialism and occupation are dismantled once and for all.